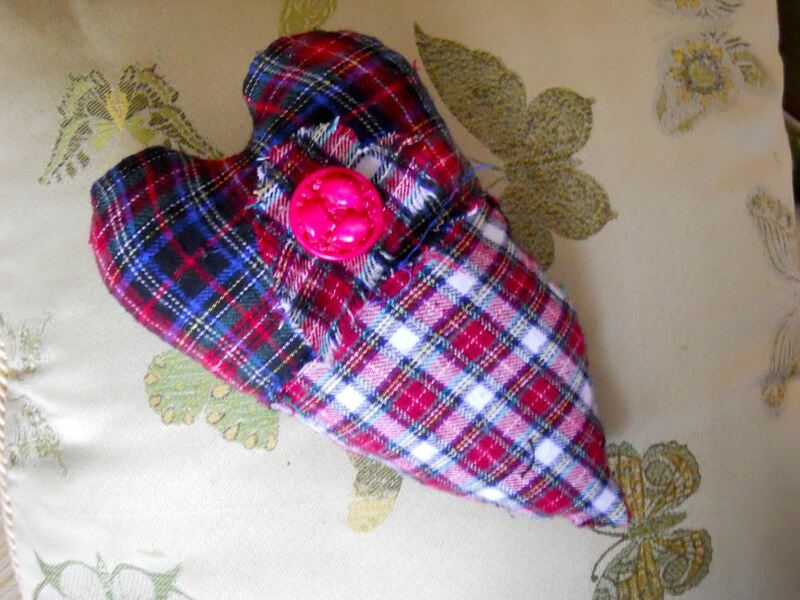 This heart pillow was a gift from one of our January 2018 beginning beekeeper students. During our January 24, 2018 beginning beekeeping class, one of the students snuck this little heart pillow under my arm and said thank you for all you've done to set up the class. Turns out Jesse made the pillows for all of the class instructors out of fabrics from a favorite skirt of her mothers, which makes the re-purposing sweet. The button is from one of her mom's coats and Jesse said the button reminded her of the shape of bees. I was so busy with the class I didn't notice the second, smaller heart until I got home and pulled the pillow out of the bag. True to form, my little yellow cat Shirley Honey was batting the pillow around within minutes of finding it on the sofa so I now have to find a safe place to keep it unless its to become the latest cat play toy. Thanks, Jesse, good luck with your bees! Honeybee stockings that hung on the first two hives I had when I first started beekeeping. The first year I started beekeeping, I had two hives I named after my mother and grandmother. It was fun to sit and watch the bees going in and out, and I would have learned faster if a mentor had been available which is why years later I started a local bee club to support students from my beekeeping classes, at their request. As it was, I had read a ton of books before starting, was attending a beekeeping club run by a commercial honey producer and, at times, found my beekeeping technique preferences at odds with his recommendations. Killing my queen bees every year, for example. But I don't keep the colonies for honey-production, I would say, I just want them around for pollination. You still should kill your queens off every year and replace them, he would say. Well that didn't happen, and now 7 years later it still doesn't happen unless I inadvertently squish her somehow. Even most of the older, slower-laying queens get to live out their lives in my hives or nucs and, in most cases, the worker bees know when it's time to literally grow a new one. This first year in beekeeping, though, everything was so new and exciting. I can still remember the thrill of the daily discoveries - still have some of those today. 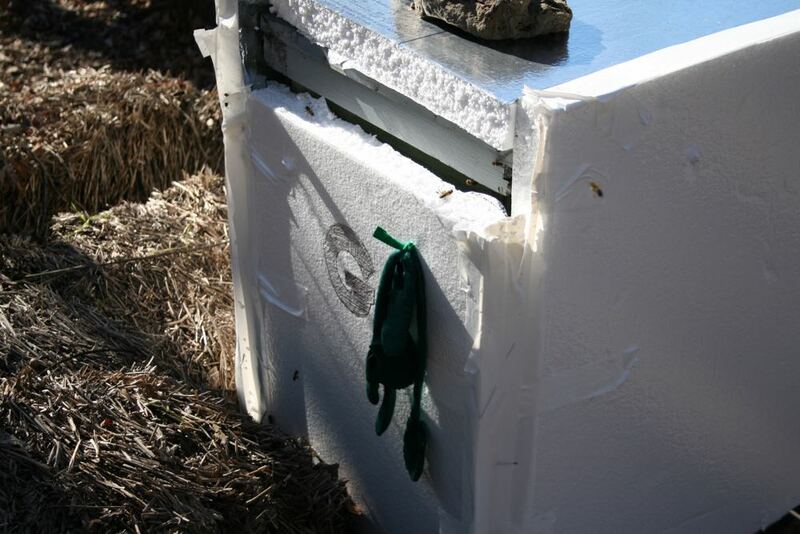 And as the year wrapped up, I literally wrapped the two hives in styrofoam to help insulate them from the cold winds that hit my limestone hillside. It was suggested I could try roofing insulation but I liked the idea of the styrofoam better, especially against the cold winds. One morning a couple of days before Christmas, an old truck stopped in front of my house and a man knocked on my door to ask if I wanted the "refrigerators" in the garden hauled off. It took me a minute to realize he meant my nicely-insulated honeybee hives! Inspired to add to the neighborhood holiday decor and make sure others didn't think I had abandoned refrigerators in my garden, I made fleece Christmas stockings for each of the hives. They hung on the front where everyone could see them, six little booties for each of the colony queens. 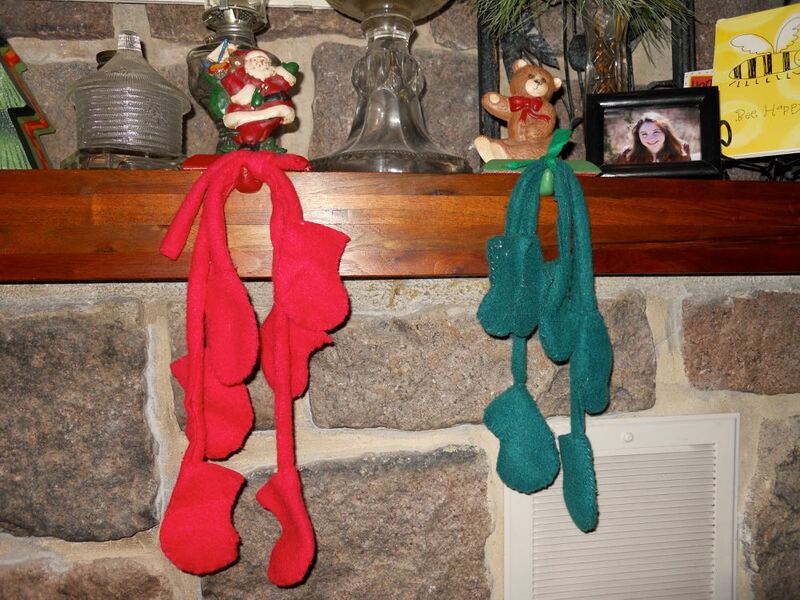 The green honeybee stockings were hung on Mildred hive, named after my mother. The red honeybee stockings were hung on the front of Gertrude hive, named for my grandmother. I almost forgot about the stockings until spring, when one of the neighbor boys was riding by on his bicycle and he asked if Santa had found the stockings hanging from the hives. Looking into those young blue eyes, I said "yes, he did, and he took the little jar of honey I left out for him, too." The neighbor nodded and rode off on his bike, hopefully another year of believing still ahead of him. 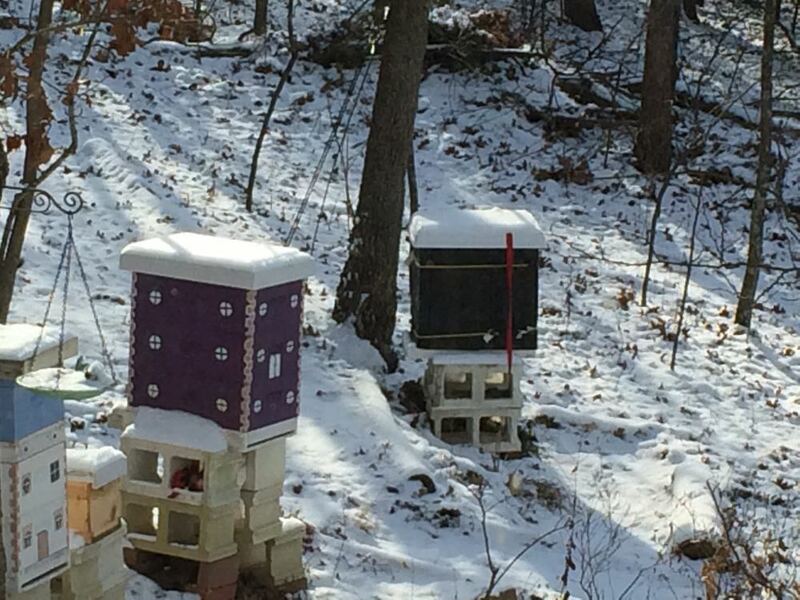 My hives today are colorful and wrapped in black insulated material to still provide a wind break. I have more colonies now. They are painted to look like houses and have a black insulated wrap around the middle so they don't look like abandoned apartment refrigerators. Those first bee stockings hang on my den fireplace mantle, a wonderful reminder of the awe, and excitement, of getting into beekeeping, and the promise of the new adventures ahead. From my hives to yours, Merry Christmas! A gift of raw, strained honey from my bee buddy David. Thanks, David! One of the best gifts you can give a beekeeper is a bottle of honey, preferably from your own hives but a bottle of real honey nevertheless. No two bottles of honey are the same, nor will they taste the same so giving honey is similar to gifting a bottle of wine. The soil terroir, what plants are available, weather conditions - all contribute to the unique taste of honey. It can also vary by time of year harvested and even by honey color. As beekeeping friends, it's always a treat to have a honey jar gifted. My bee buddy David gave me a little honey bear of his 2016 honey harvest, raw strained honey with no other modifications. It's just like the bees made it. The back of David's honey bear so that I will know where the honey came from - his apiary. In 2015, I was part of a Missouri State Beekeepers Association team working successfully with Missouri's Legislature to update the state's honey bottling law. Previously, honey was lumped in with jams and jellies, requiring beekeepers to invest in $30,000 commercial kitchens to be able to bottle honey for sale. With the changes in Missouri's honey bottling laws, beekeepers can now bottle the honey in their kitchens and add labels with the honey source prior to sales. No need to build, or use, commercial kitchens. As beekeepers, we are not making the honey, as one does with jams and jellies. All beekeepers are doing is bottling what bees have made. Sorry, this bottle of honey is not for sale. It was a gift and I fully intend to enjoy it over cold winter days. Thank you, David, and please thank your bees. This honey looks more like Grade A+! This charming children's book easily explains the role of bees in our ecosystems. If you are looking for a bee book for a child, the Honey Makers by Gail Gibbons is an excellent choice. The colorful paperback book has charming illustrations of bees and beekeeping. The explanations are simply clear, and the concepts cover the basics from the role of bees in pollination to the various places they live. One of the pages in Gail Gibbons "The Honey Makers" showing the various bee homes. Even if the gift recipient is young and can't read, the illustrations convey the relationship bees have to flowers. When my brothers were growing up, they loved well-illustrated books and would make their own stories based on the drawings and pictures. Our grandmother, who worked at a used book store in California, would send us wonderful books for Christmas gifts. After the furor of unwrapping presents, we would all settle down to leaf through books together, each one an invitation to a new place or adventure. A forager bee visits a flower in Gail Gibbon's "The Honey Maker" color illustrations. To further personalize, add a little jar of your honey and a gift card inviting the child to an apiary visit next spring. Children are the future of beekeeping. The earlier we can get them engaged, the better we will all "bee"! Do you have a favorite children's beekeeping book? My office door used to have a message board so people visiting could easily track me down. Until I came in and found this charming sign hanging in its place. 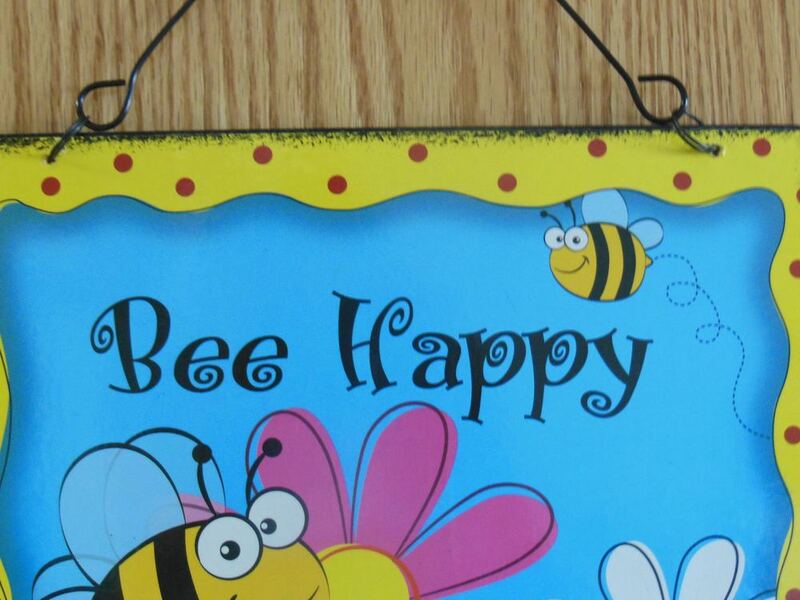 There really is something happy about happy bees. There also is something very happy about working with someone kind enough to leave me this sign. Hard not to start one's day with a smile, or two. 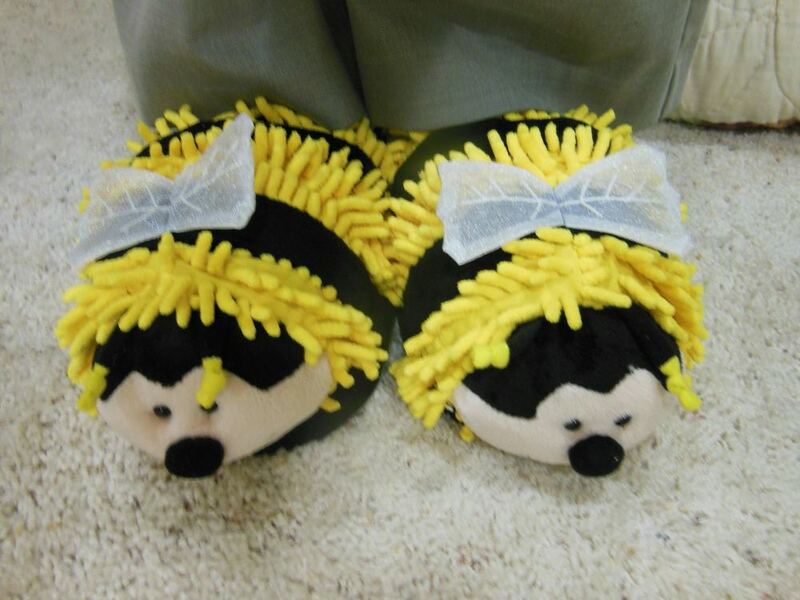 Why didn't I think of that, of course I can model my new gift honeybee slippers! According to my beekeeping friend Cheryl, who gave these to me for Christmas and was reticent to divulge the price, she ordered them from Amazon. 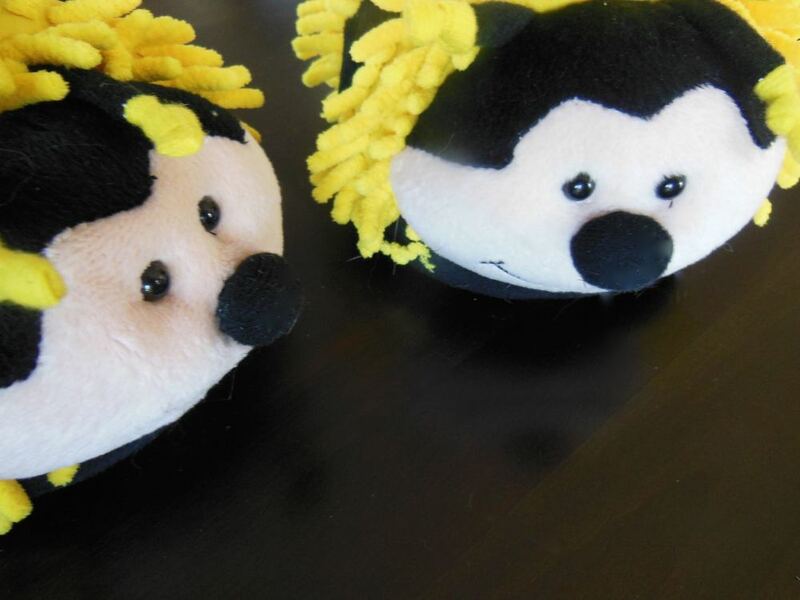 They are called "Bumble Bee Slippers." $22 a pair. 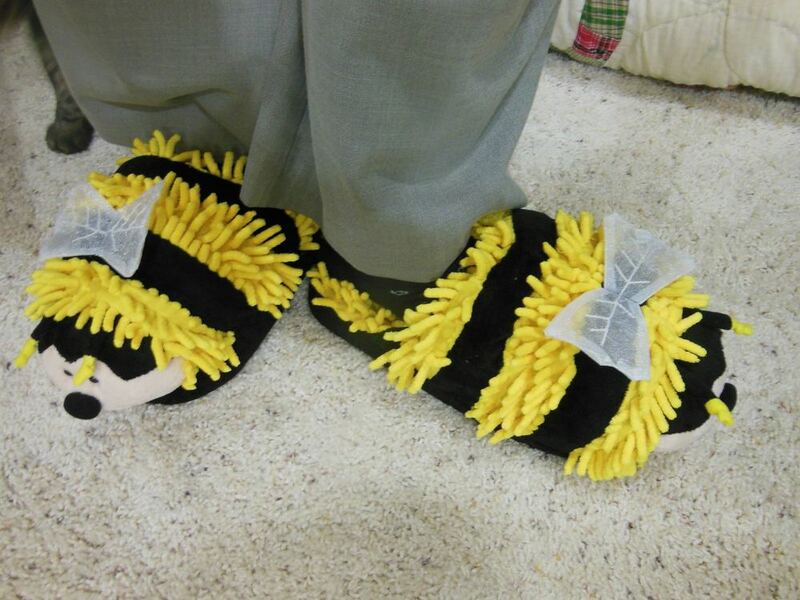 My beekeeping friend Cheryl surprised me with these charming bee slippers. I don't know how she knew but when I'm alone, I tend to putter around the house in slippers, especially on gloomy, overcast weekend mornings. I can easily cheer up when I start my day with a quick visit to see my honeybee girls, their work day starting as soon as the sun hits their bee hives. Seeing these slippers waiting for me are a close second! 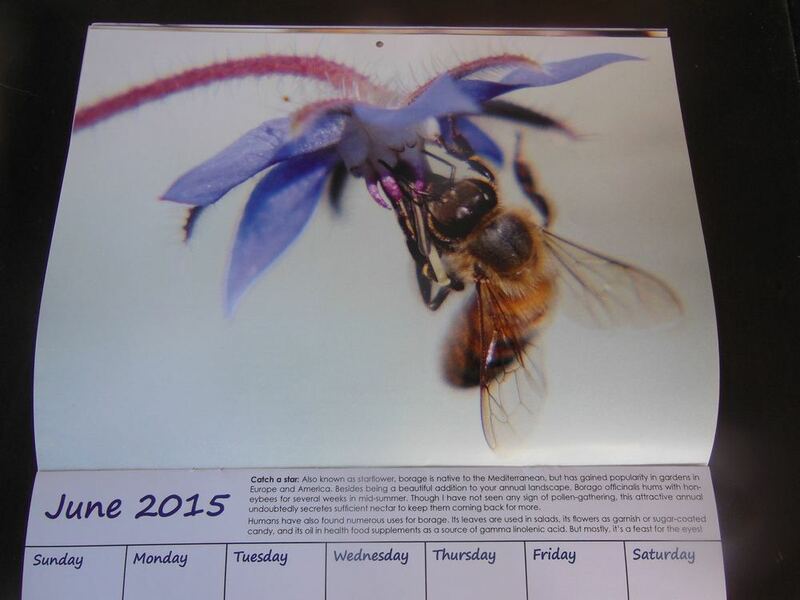 My beekeeping friend Eugene Makovec photographed and produced this lovely 10x14 inch 2015 honeybee calendar. It's a beautiful tribute to his father and a delightful way to celebrate bees, and beekeeping. 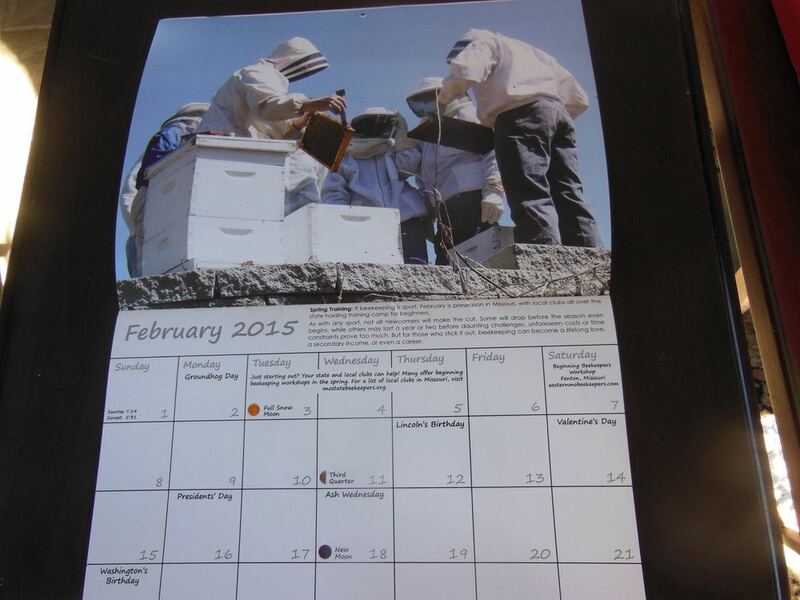 Nice gift idea for beekeepers, and bee lovers on your gift list! One of my 2014 Christmas gifts was a charming pair of very soft bee socks. Not only are they very warm but they include little rubber circles on the bottom so I can safely wear them around the house without slipping. Great to stay warm either with bee socks or bee quilts. Now the question is, are these honeybees or bumble bees?